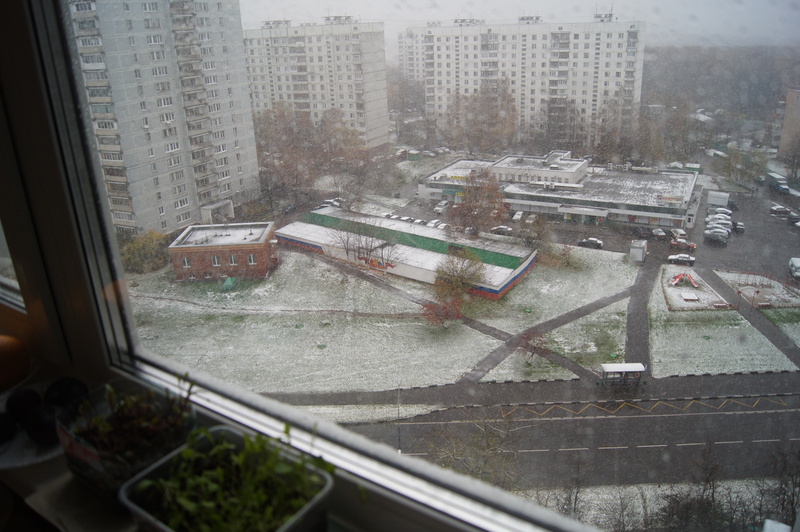 I think Moscow fall is really happening now. We’ve had a few false alarms. By “Moscow Fall,” I mean the October/November everyone has been warning me about. The Fall that is still dark at 10 am. The Fall that rains every single day. The Fall when gray clouds and fog fill the sky. When the temperature drops. When you pray that it will snow because at least the snow will be better than the slush covering the sidewalks. When you just can’t wake up in the morning…or in the afternoon. And you start taking Vitamin D and consider using light therapy. I’ve been waiting. I was told it would get cold, and then we would get an extra week of summer. This happens every year. And we got that extra week of summer. And I got outside as much as I could. And then two weeks ago, I woke up on a Monday and it was raining and it seemed like the sun was never going to come out, so I sang in the rain and leaped over puddles and bought an Americano before work as a comfort and said to myself “Sorry, kid. 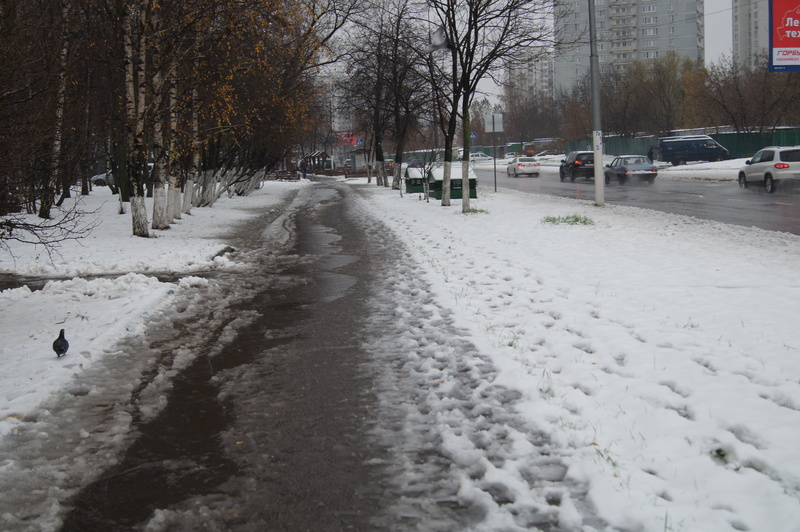 Here is comes.” But the next day, it was sunny and warm. And I was confused. And the weather must’ve been too because it went back and forth and back and forth. And then we had a stretch of nice weather again. And then this weekend, the weather was wonderful. It was sunny and so warm that I actually started sweating while running. 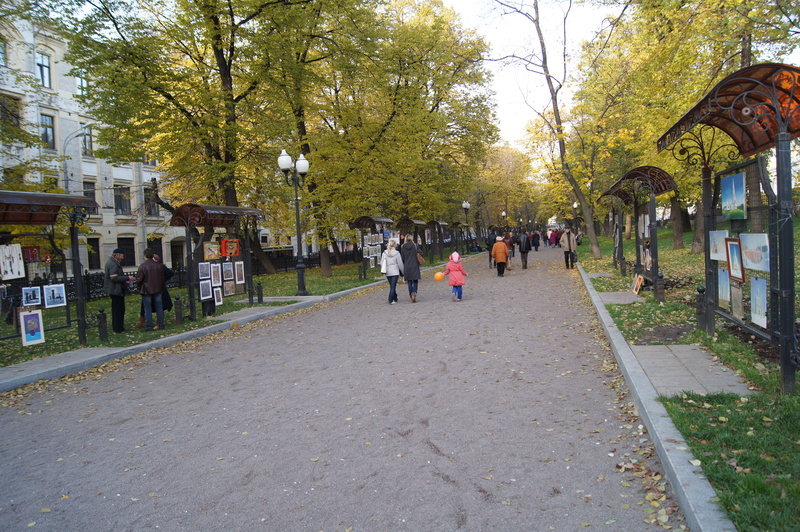 I felt like staying in the city but I wanted to do something, so I decided to walk the Boulevard Ring. If you’ve looked at a map of Moscow, you’ll see that it’s a series of rings. And the Boulevard Ring is what it sounds like–a ring of lovely boulevards. 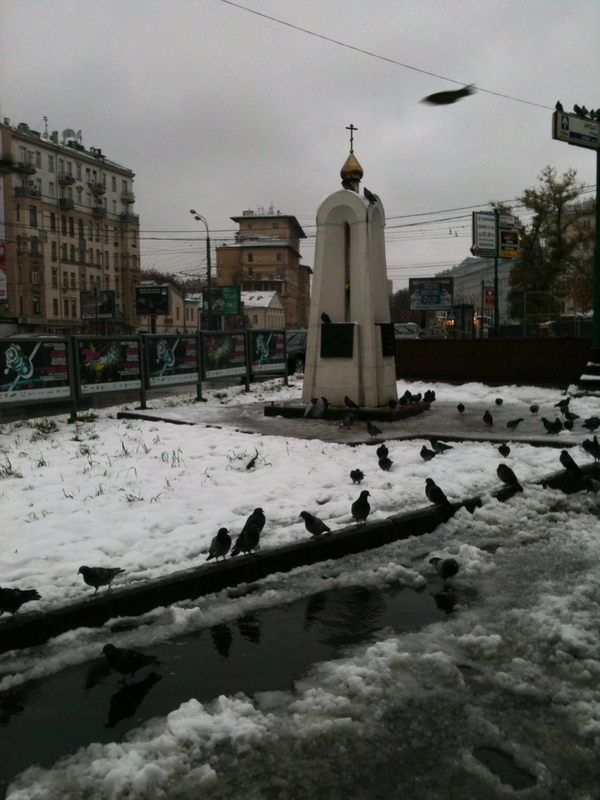 When the weather is nice, Muscovites get out and walk. If you walk the entire ring, it takes about 1.5 to 2 hours. 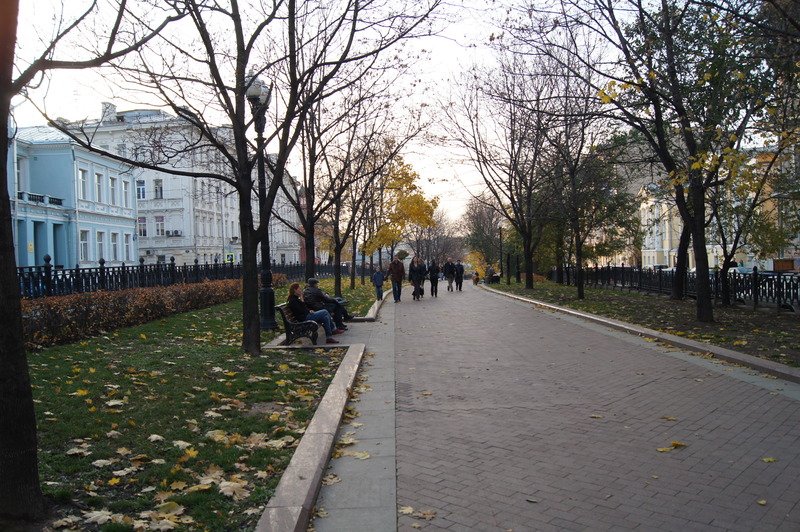 On one of my first weekends in Moscow, I walked a few of the boulevards with friends from work. But this time, it would be more of an adventure: one, I would walk the entire ring and two, I would have to find my way between the boulevards. 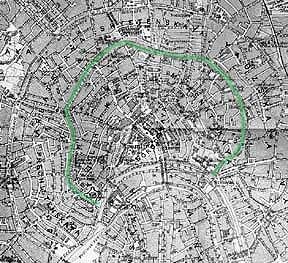 Though it’s called a “ring,” the connections between the boulevards aren’t always obvious. Sometimes there are signs to the next boulevard, but not always. So, I packed the handy city map I’d yet to use, and when I wasn’t sure which way I should go, I whipped it out. It is big–think road trip map that covers your entire windshield–and it crinkled in the wind and was almost impossible to fold up and I probably looked like a stupid tourist. But: I never got lost. Ever. And honestly, I kind of like the image of myself standing on a windy street corner wrangling an enormous map. The changing leaves make the boulevards particularly lovely this time of year. But I’m afraid none of my photos really capture what the boulevards felt like on Saturday. It felt brisk. And alive. More European than Russian. 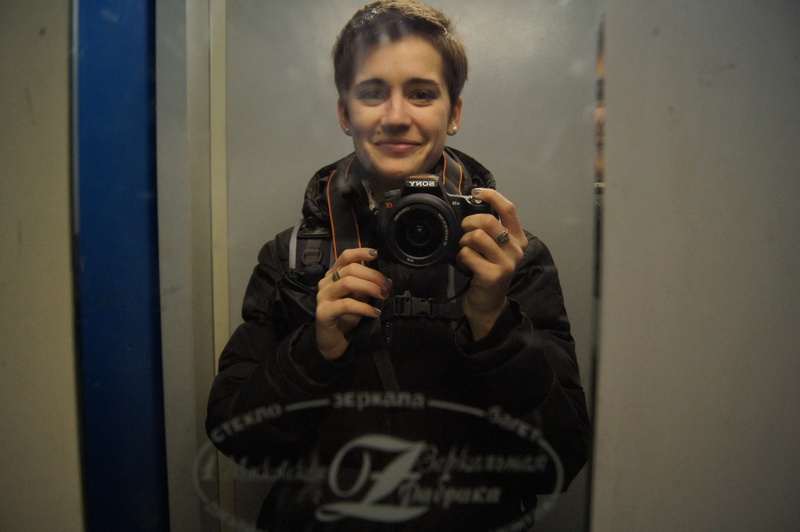 It was the feeling of seeing the places you pass through frequently underground on the metro. 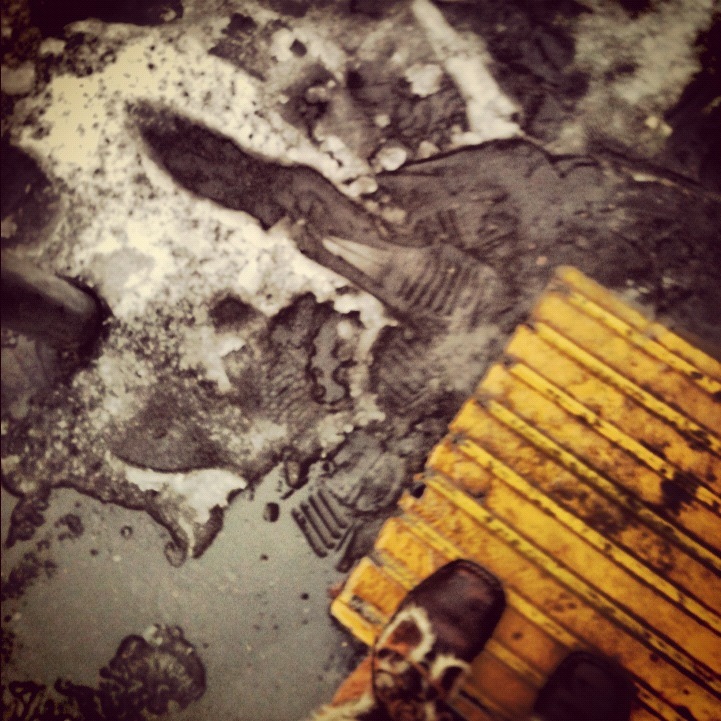 It was understanding how the different pockets of the city you know fit together. 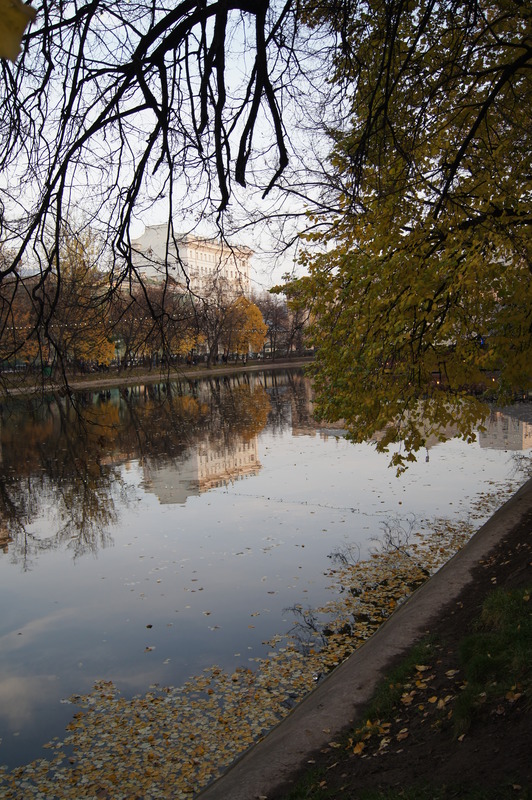 It was approaching a street or intersection or the beautiful ponds at Chistie Prudi and realizing “Hey–I’ve been here.” And knowing that Chistie Prudi is only a fifteen minute walk from my favorite area–Kitay Gorod. Hell, it was realizing I even have a favorite area. And so, while mid-October means that the weather is about to get depressing–starting today–and to stay depressing for quite some time and that it will be impossible for me to run outside and maybe even impossible to wake up before 7:30 because it is as dark then as it is now at 9:30 pm, it means other things too. It means I’ve been here for two months. It means I have friends I can call for coffee dates at the end of my stroll through the boulevard. It means I’ve gone to a bar and bought myself a beer and read Calvino. That I got a haircut from a Russian hairstylist and lived to tell the tale, that in fact, I like the haircut. It means I’m a regular at the dairy store by the metro and the market near my apartment. It means I can use (with some accuracy) at least thirty more Russian words and phrases than I could a month ago. 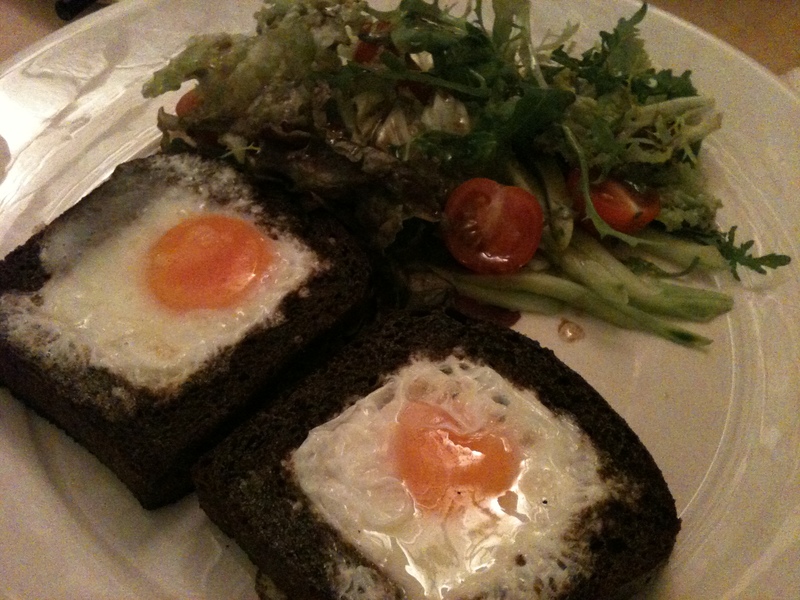 It means that in the last two weeks, I’ve found a favorite restaurant. And most importantly, a coffee shop that will become my coffee shop, Ludi Kak Ludi (and they played an awesome remix-y version of Springsteen’s “Fire” the last time I was there). It means I live here. the one where kara spends 8.5 hours with four men in her apartment. or, saturday window installation. 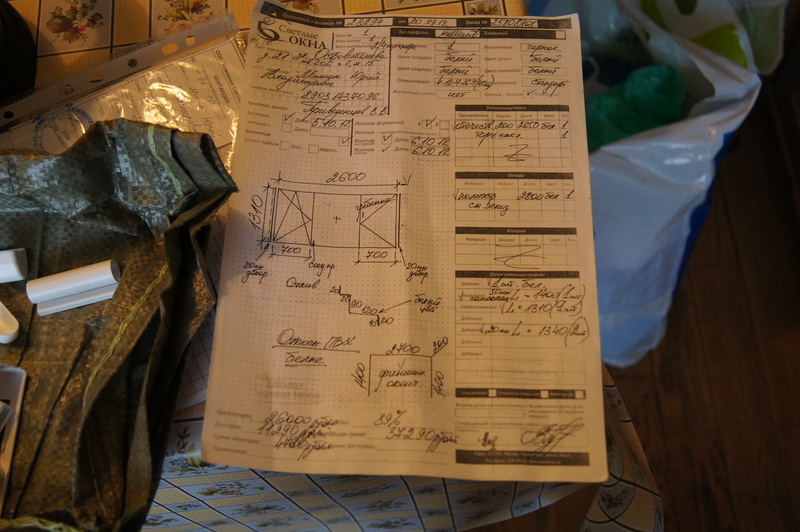 I alluded to this in an earlier post, mentioning Landlord Vladimir and his sons being here with “the window master” to measure for new windows in the kitchen. Well, Saturday October 6th I got those new windows. And what a day that was. At 10:30 am, Yuri and Yuri’s brother (who is named Dimitry, I learned during our 8 and a half hours together) showed up to move things out of the way. Since the kitchen (like the rest of the apartment) is small, this meant that everything had to be moved. 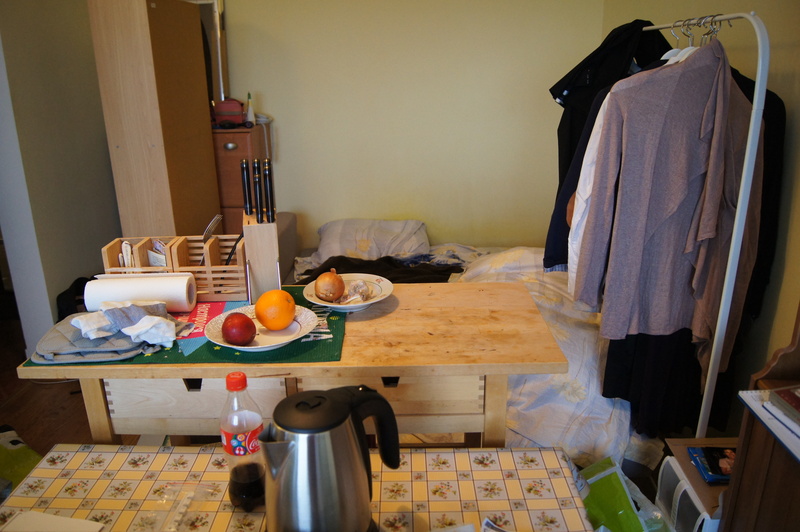 They carried out the bookshelf that serves as my pantry, the buffet/hutch that holds my dishes, and the desk that serves as my kitchen table. All of this went into my living room/bedroom and since I’d neglected to fold up my couch bed, the room was packed. The two window guys came around 11:20. They said “здравствуйте” to me. And then five minutes later I turned around to see them changing clothes in my living/bedroom. The bigger one got a phone call and took it, without a shirt, in my kitchen. And he didn’t seem bothered by it. He just stood there, shirtless in my kitchen. I looked away, and when I turned around again, they had both taken off their pants and were changing into red overalls, installing windows Mario and Luigi style. They started by ripping out the old windows–literally. I watched chips of paint and wood land all over the kitchen floor. And I made a mental note to wash the dirty pot and pan I’d left on the stove super well to avoid the lead poisoning I was sure consuming Russian paint would incur. 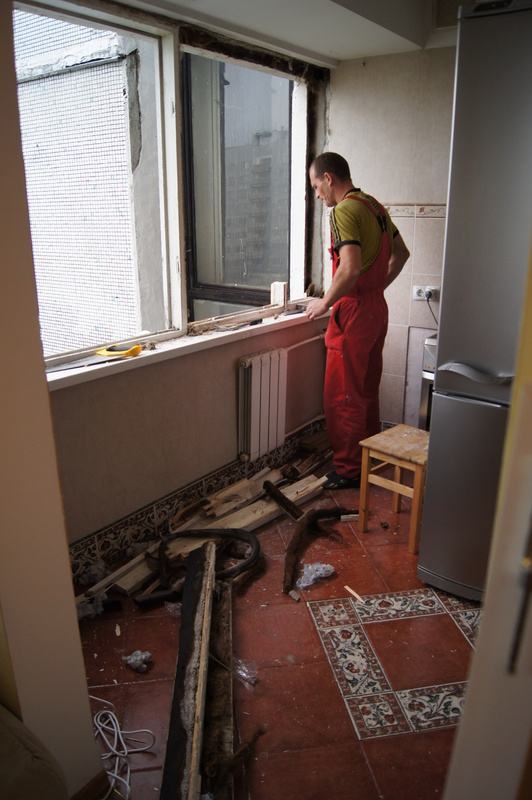 Yuri and Dimitry carried pieces of wood and windows out of the apartment. And I have no idea where they took them, certainly not to the trash chute near the elevator. The IKEA stool that sits at my kitchen table became a sawhorse and they measured and cut things for the outside of the window and the inside of the window. 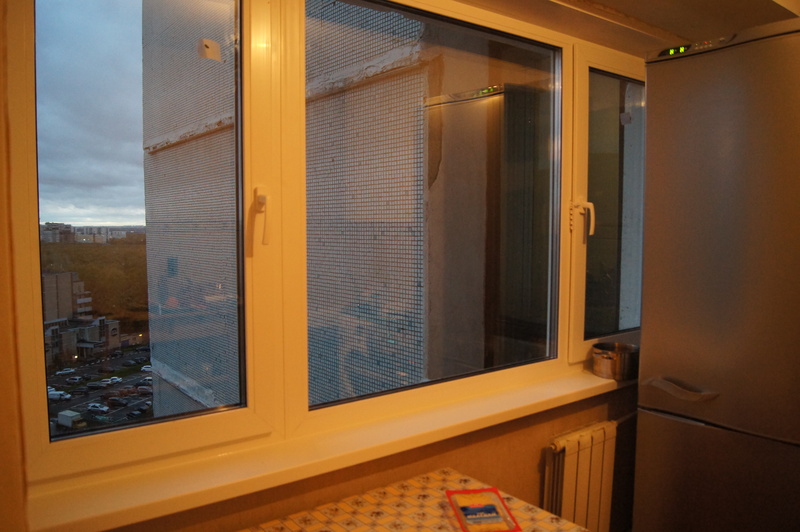 The apartment was freezing because it is October and it is Russia and there were no windows to protect us from the wind/rain. And so I sported a flannel shirt with Grandma Bollinger’s Canada sweatshirt (hood up!) all day. The window guys took frequent smoke breaks. At 1:45, they said “one час.” After that smoke break, they started putting in glass and windows, and that seemed really promising as far as completion of the project went. I had to be here but I also had to be out of the way. So I sat at my computer desk. And I amused myself and watched the day pass me by, much like you do on a long car trip. I found their presence quite humorous for a few hours, another sitcom episode, the one where Kara spends an entire day in a 640 square foot apartment with four Russian men. I took photos of my living room/bedroom completely filled with stuff. I spoke Russian with Yuri (very minimally). I let Yuri borrow magazines and newspapers. I learned the window guys were from the Ukraine. When they asked for music, I played AC/DC, and they played air guitar. They hadn’t heard of Bruce Springsteen and that was quite disappointing. But somewhere around 3:30, it became very clear that Yuri, Dimitry, and I were done with the window guys being there. Rather than rolling our eyes and laughing at how long it was taking, we just rolled our eyes, no laughter. We stopped entertaining each other. We showed disapproval of their smoke breaks. I was ready for them to be gone. And they showed no signs of ending. Then at 4:30, the Ukranian window guys said “one час.” I don’t know window installation words but I think that maybe some kind of caulking or something needed to dry. And then they left for a smoke break. At this point, Yuri and Dimitry cleaned the kitchen quickly, trying to minimize the work they’d have to do later. I tried to help but they wouldn’t let me. The five of us stood/sat in the apartment, not looking at each other or talking to each other. And then whatever needed to dry, dried, and the window guys finished their work. And finally, at 6:30, the window guys said they were finished. They changed back into their street clothes in my living room. And then they left. 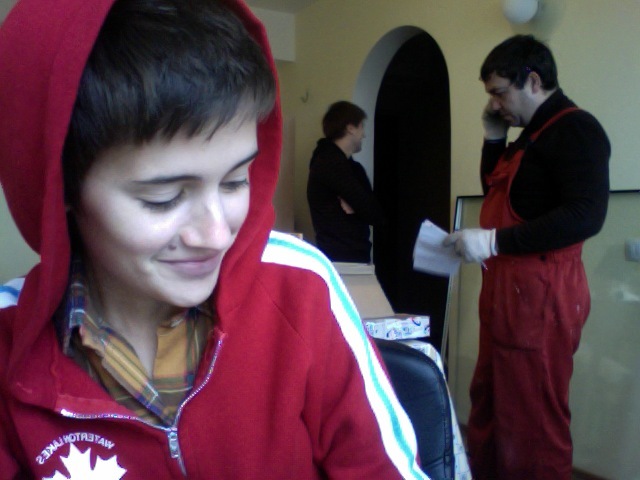 Yuri, Dimitry, and I quickly cleaned and moved all the furniture back into the kitchen. We were polite to one another, but we were all ready to be finished so chatter was minimal. I was already chopping vegetables and cracking an egg for dinner when they left at 7. The window guys being there so long meant I was almost late for the American film I was planning to see at a foreign theater in the center of the city. But I ate dinner real fast, hopped on the metro, and walked really fast. I made it. Just in time. It’s good that this window thing is done. It’s getting cold and the old windows were drafty. But I don’t ever want to do it again. And though I wouldn’t say I feel this way about everything, I feel this way about quite a few things in Russia. I should be studying Russian right now. I know this. Already, after only one 1.5 hour class, there are so many rules to memorize. And soon! But, they say that teaching someone something is actually the best way to learn it, so my theory is that instead of studying, I will: a) write a poem (in process…) and b) write a short blog entry with an abridged version of the rules. I’ll be learning. Teacher friends agree? Good. Let’s go. They match up: б goes with п, B with ф, г with к, д with т, ж with щ, and з with с. 3) Before voiced consonants, voiceless consonants become voiced, like с братом [zbrahtom]. For this example, you also must know that prepositions are simply connected to the next word (so the с is just added directly to братом). And actually, though that’s only 1/3 of tonight’s lesson, I think I’ll stop. You got all that?